Tarp camp at Cleveland Lake, High Uintas Wilderness, Utah. 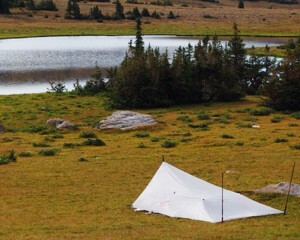 This is a 9-foot square flat tarp made by Hyperlite Mountain Gear (link). Weight is about 9 oz naked and complete with enough guy lines and stakes for a serious storm above the treeline, about a pound.